Learning at home may seem easier than attending class, but a lot of times it is more challenging. You must keep to a set schedule, rely on your books and the internet for answers and motivate yourself to learn more everyday. Here are some tips for learning American Sign language effectively at home. Do not try to learn the whole video in just one sitting. Yes it is possible to watch the whole thing in a day, but to really learn it take it a lesson at a time. Learn lesson #1 and put it away. Let it stew in your brain for a day or two before you move on to Lesson #2. As you progress through the lessons, be sure to revisit what you learned in previous lessons. Do this often to keep all the material fresh. Maybe before you start the next lesson do a quick run through of the last. Or, try writing some key questions during the lesson. Then the next time, be sure you can answer the questions before moving on. This is not school! No more begging for admiration from your teachers. Admire yourself! If you are proud of yourself for completing a lesson, treat yourself or celebrate in your own way. This will motivate you to continue. 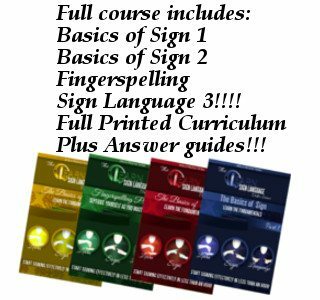 Learning Sign Language at home can be rewarding but challenging to keep your self on course. Try these tips to make the most out of our at Home ASL Video Course.